Many of our private advisory group meetings start with an innovative, inspirational and highly practical Vistage speaker workshop. The focus of our business speaker workshops is to put you in a better position; to make better business decisions and to be more effective. Some focus on WHY a particular idea or technique is important. Others focus more on HOW to apply tools and techniques to make you and your organisation more successful. At Vistage we have direct access to some of the world’s leading business speakers and experts on a wide variety of topics. You’ll not only learn from them in a small group setting but you will be able to challenge them, ask direct questions and get their views on how best to implement what you learn. Dynamic presentations on the topics that matter most to business leaders. Specific strategies and techniques that executives can apply immediately. Customised presentations tailored to the needs of each Vistage group. A small-group workshop setting where interaction is the norm. We select our speakers just as carefully as we select our Chairs. If you’re looking for the very best in business and leadership learning, it’s here. Vistage events provide actionable takeaway value from world-class speakers, not just information, which can be used immediately to keep you and your company moving forward. The Vistage Open Day programme are half day or full day events for Vistage members and their teams as well as invited guests. Join 100s of CEOs, MDs, business owners and executives to have a fantastic day and to hear a world class speaker. 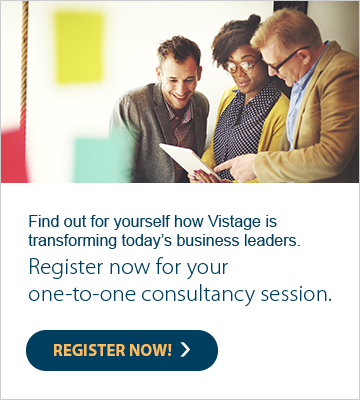 Vistage offers a unique combination of resources for accelerating business performance: monthly meetings with non-competitive business peers; one-to-one coaching & mentoring sessions; expert speakers and interactive workshops; a rich online library of content, best practices, webinars, and more. Access to a global member network of more than 22,000 business leaders. Problem-solving peer group with 10-15 senior executives and business leaders. Find the right type of group for you. Engage and gain valuable insight from expert speakers in a small group setting; attend events where a wide array of members come to connect. Each month you and your Chair will have a private, one to one session designed to help you identify your most important needs and opportunities. Use MyVistage to connect with fellow members between group meetings, access a wealth of leadership content and tap into the broader international Vistage community.